Our Murphy-style wall beds are perfect for guest rooms throughout Austin, TX. Murphy beds give Austin homeowners the freedom to host houseguests easily any time of year. Our sleek wall beds blend in to the existing décor in any room of the house. 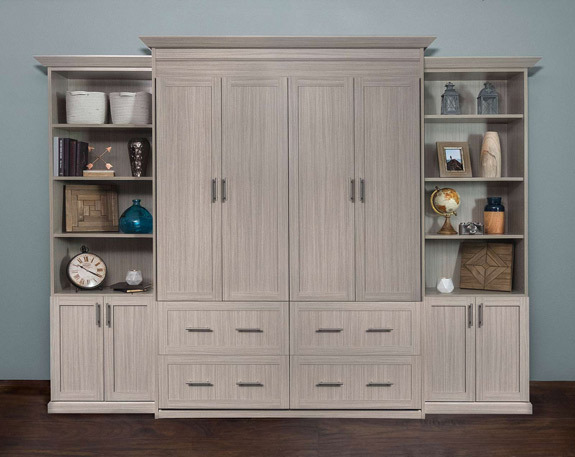 Whether you plan to set up an entire guest room or create a dual-purpose space, we make it possible for you to offer comfortable accommodations without losing valuable storage space in your home. Murphy wall beds are perfect for any occasion, including holidays, kids’ slumber parties and family visits. Guests traveling through different time zones can be particularly sensitive to the sleeping conditions at their destinations, which makes wall beds even more appealing. While fold-out sofa beds offer a lumpy sleeping surface, our murphy wall beds give your guests consistent comfort throughout the night. They will wake up feeling refreshed and ready to tackle the day, whatever it might hold. Our designers will work with you to develop a design that fits all of your needs. Choose a completely fresh, updated style for your home or personalize your wall bed to match existing décor. We offer a variety of accessories to help you get the perfect look, including your choice of finishes, hardware and configurations. Our murphy wall beds come in steel or aluminum frames. Each material is available in either full or queen size beds. Choose the size and material that best fit your needs for a completely custom murphy wall bed that brings out the best in your home design. Your guests will sleep comfortably and you will love how easily your wall bed folds up at the end of the day. A better guest room is a click away. Contact us today to schedule your complimentary design consultation and speak with a designer about your home design goals.